‘Twas The Night Before Vs. System 2PCG: Winter Soldier Defenders Preview! But it’s in less than a day. What could we possibly do? “Great idea!” said the Brand team. To the season we’re in. Suits this like no other. His Bionic Arm is quite jacked. That’s even larger than Cap! 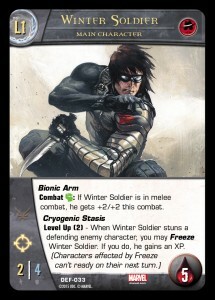 Put Winter Soldier on ice. Merely glue him down twice. His Sniper Rifle is deadlier. By your opponent’s Front Row. And shoots past them all. Of what Defenders has waiting. We have no qualms in stating. Both this weekend and next. Any news on an official release date yet?